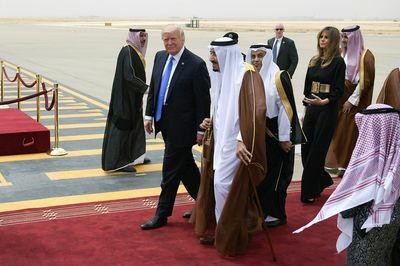 President Donald Trump arrived in Riyadh Saturday morning, the first stop on his inaugural foreign trip as he seeks to escape the controversy engulfing his administration. The president landed at 9:42 a.m. (1:42 a.m. New York time) and was greeted by King Salman as he exited Air Force One. Jets flew overhead and left a trail of red, white and blue smoke as the the two walked down a red carpet and into the airport terminal. Trump is slated to hold meetings with the Saudi monarch ahead of a Sunday conference with leaders from across the Arab world. He was also greeted with more damaging headlines back home. The New York Times reported shortly after Air Force One departed that Trump had bragged about firing FBI Director James Comey to two Russian diplomats in an Oval Office meeting, calling Comey a “nut job” and saying that his removal had relieved pressure from the Russia investigation. The Washington Post reported at about the same time that law enforcement officials had identified a senior White House adviser close to the president as a person of interest in the investigation of Russian meddling in the 2016 election. The Post report didn’t identify the adviser. Also Friday, the Senate Intelligence Committee announced that Comey had agreed to testify in open session, ending more than a week of speculation about whether he would appear publicly to make his case since he was fired by Trump on May 9. 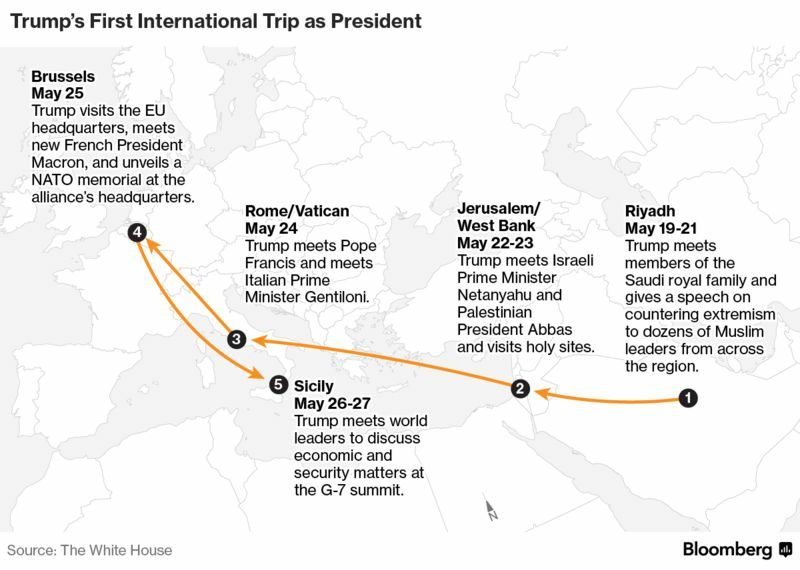 After Saudi Arabia, Trump plans stops in Israel and at the Vatican -- where he’ll meet Pope Francis -- before joining a NATO summit in Brussels to confer with top allies, including the newly elected French President Emmanuel Macron. He’ll conclude with the annual Group of Seven meeting in Sicily. The trip will be a fast-paced, high-stakes whirlwind of diplomacy, all conducted under the shadow of the deepening political crisis back home. Trump again denied there was any collusion between him or his campaign and the Russian government at a news conference on Thursday. Earlier this week, the Department of Justice announced it was appointing former FBI Director Robert Mueller as a special counsel charged with leading the federal investigation. Trump also denied asking Comey to drop the Flynn investigation. “No. No. Next question,” he said at the news conference.